Situated atop the breathtaking Hudson Palisades, Fort Lee features picturesque landscapes and a rich local history. The Palisades are a National Natural Landmark, and their steep cliffs offer an impressive view of the New York City skyline. Named for the site of an early American Revolutionary War, Fort Lee is known as the birthplace of the American film industry. The mix of beauty, culture and convenience to Manhattan make Fort Lee a popular location in New Jersey for both families and businesses. If you are planning a move to, within or away from the area, choose the leader among Fort Lee moving companies - Booth Movers - for a stress-free relocation. 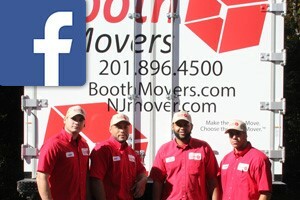 Since 1945, we have offered high quality customer-oriented northern New Jersey moving services and storage solutions. Our dedication to excellence and customer satisfaction has earned us the prestigious title of ProMover with the American Moving & Storage Association, as well as accreditation and an “A+” rating with the Better Business Bureau. From studio apartments to corporate warehouses, Booth Movers is the Fort Lee moving company you can trust! Residential Moving: From studio apartments to expansive estates, our northern New Jersey movers can handle every aspect of your residential move. Household Moving: Our access to the best equipment and professionals in the industry ensure your household move is smooth and seamless. Local Moving: Whether you are moving across the street or across town, our Fort Lee movers have extensive knowledge of Bergen County and the surrounding areas for an efficient move. Long-Distance Moving: Let Booth Movers do the heavy lifting for you so you don’t feel completely overwhelmed by your long-distance move. Interstate Moving: Our professional network allows us to complete your interstate move easily and efficiently. Full-Service Moving: Your most valuable and prized possessions are safe with our experienced and skilled full-service movers. International Moving: Enjoy a stress-free international move when you select the experts at Booth Movers. For more information on what makes us the leader among Fort Lee moving companies, contact us today. Call to discuss your upcoming relocation with one of our friendly and knowledgeable moving specialists or complete our convenient online quote form today to request your free estimate. Whether you need help with a small apartment move or are planning an international relocation, our BBB-accredited Fort Lee movers have the expertise to handle all the details!